Situated 150 miles west of Buffalo NY and fifteen miles north of Lake Erie, London Ontario isn’t exactly a place where you’d expect to find solar powered houses. But with its average of 3.3 peak sun hours per day, a ten kilowatt photovoltaic array can generate 12 MWh of electricity each year, which is worth several thousand dollars per year in electricity costs alone. Coupled with an energy efficient house and responsible use of water, owners of a net-zero home in this Canadian town could pay almost nothing for their utilities. 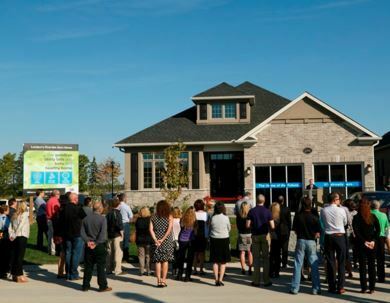 That’s why Sifton Properties, a home builder in London Ontario, just built a net-zero energy home to showcase an affordable house that uses sustainable practices. A ten kW photovoltaic array provides more electricity (annually) than the home uses in a year. Excess electricity is sold to the utility through a net-metering agreement. To reduce the footprint and improve aesthetics, solar shingles, made of high-efficiency monocrystalline PV cells, are used instead of traditional solar panels. The shingles have integrated ventilation to help them stay cool, which keeps them operating at peak performance levels. It’s less expensive to conserve electricity than to generate it, so naturally Sifton chose LED lighting and Energy Star appliances throughout the house. Motion sensors turn off the lights automatically when the room is unoccupied. Automatic window shades round out the passive lighting system, bringing light in during the day and keeping heat in at night. I’d probably add a few solar tubes to help provide daylighting to interior spaces. For the gadget freaks, the designers incorporated USB charging ports throughout the house. The home is air-tight and very well insulated. Walls include 6” of fiberglass batt insulation on the inside plus 3” of foam on the outside, giving the walls an R39 insulating factor, almost double that of a standard 2x4 wall. Even the basement is insulated, with R11 spray foam under the floor and R27 fiberglass batt on the walls. The attic features 28% more insulation than a typical house, giving it an R70 rating. Triple pane low-E windows throughout the house reduce heat loss through the glass. To deliver enough fresh air for healthy living, a ventilation fan provides frequent air exchanges. A heat recovery ventilation unit pretreats incoming air, which recovers 85% of the inside air’s heat (or cool, depending on the season) before exhausting it to the outside. (I know that “cool” doesn’t transfer, heat does. If you’re a stickler for semantics, my apologies.) In a similar way, hot water going down the drain is routed through a heat recovery unit to preheat water before going to the high efficiency water heater. The house’s primary heating and cooling technology is an air source heat pump, which most people call “central air conditioning.” The great thing about an air conditioner is that in addition to moving heat from inside to outside in the summer, the process can be reversed in the winter. Even in sub-zero temperatures, an air source heat pump will heat an average home. Since this house is so well insulated, not a lot of heat is needed. In temperate climates, however, building codes require a “traditional” heat source like a furnace or electric baseboard heating. To appease the building inspectors, Sifton installed the smallest available unit, a 98% efficient gas furnace. It’s largely a backup system that will fire up only on the absolute coldest days of the year. Rainwater is captured and stored in a cistern; that water is used for toilet flushing and other non-potable applications. (Health codes don’t allow rainwater to be used for drinking.) Standard water conservation devices include low-flow shower heads and efficient toilets. The front-loading washing machine isn’t just energy efficient, it also uses less water than a top-loader. Sustainability isn’t just about energy production and conservation, it’s also about the wise use of all natural resources. Sifton’s net-zero home includes engineered floors made from an air-purifying hardwood. 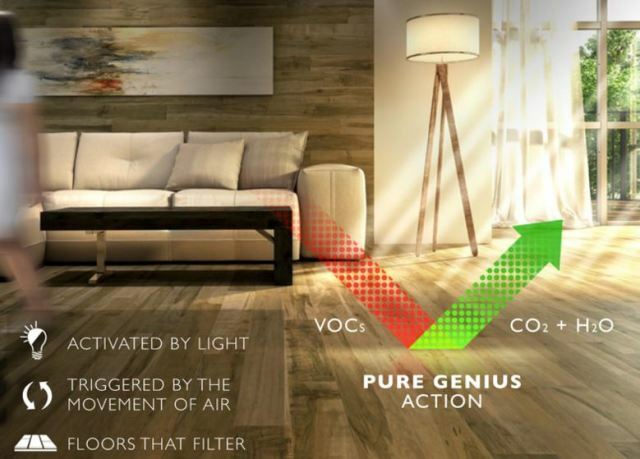 Sifton doesn’t specify which brand of flooring, but I’m assuming it’s something like the Lauzon Pure Genius, which has been independently tested and shown to reduce several household impurities and volatile organic chemicals (VOCs). Recycled materials are used in the engineered hardwood floors as well as the carpet underpad. The house is essentially a prefab construction, including engineered trusses, which reduces building material waste. And the kitchen includes a built-in recycling center to encourage the homeowners to recycle. All the energy efficient and energy producing technology comes at a price - in this case, about $80k above the cost of a comparable home without these features. Richard Sifton, CEO of Sifton Properties, says that the extra cost will more than pay for itself over the life of the house. I estimated that the electricity savings would be around $2000 per year. By itself, that turns into a 40 year payback period. When you factor in water and gas savings, it’s even better. And while it’s difficult to quantify, many health problems can be traced to chemicals found in building materials, so the environmentally-friendly paints and flooring could result in better health and lower healthcare costs. Cutting edge technology will always cost a lot until it becomes mainstream, so as more net-zero buildings are constructed, the price will become more attractive. 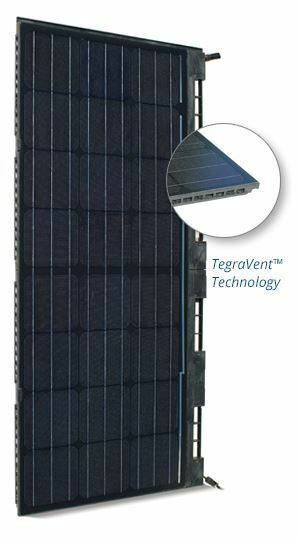 The price of photovoltaic panels has plummeted over the past few years, and as manufacturers create integrated systems, package deals on PV systems will follow suit. Moreover, as a society we need to look beyond the short-term economic factors and consider the long-term consequences of our actions. We all pay hidden costs for fossil fuels, whether that’s through direct government subsidies, military action to “secure” oil-producing nations, oil spill cleanups and the economic aftermath, pollution, and the results of climate change. Every dollar spent on renewable energy and energy efficiency represents an investment in the future. The Sifton home is a demonstrator, designed to showcase the technology of net-zero residential structures. It’s also the prototype of a model home to be used in an upcoming planned community, the West Five Development, which will include net-zero energy houses, townhouses, and condos, as well as a community microgrid with EV charging stations.